There are a ton of cryptocurrencies out there but it is good to appreciate that Bitcoin came first and literally blew up the industry. So it is fair to compare the mother of all crypto to the new kid on the block, DasCoin. 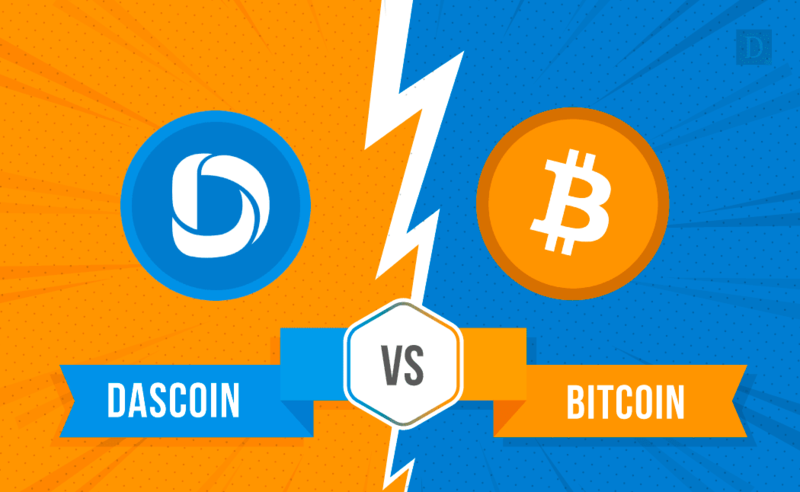 Here is a quick comparison, some differences between Bitcoin and DasCoin. It is important to note that Bitcoin is a publicly traded crypto. DasCoin has been trading within its own network for almost a year now. And on March 31, 2018, DasCoin has said it will be launching its public exchange. DasCoin has a fast blockchain technology allowing payments in just 6 seconds. Bitcoin payments can take quite a while to go through. Bitcoins are mined by miners, people who solve complex math problems presented by the Bitcoinblockchain technology. Once a miner solves a problem, new Bitcoins are released into the market and they are automatically paid a Proof of Work compensation by the system. With DasCoin, you pay hard money to the company, NetLeaders, to receive a digital license that ultimately gets you DasCoins to trade. You can then resolve to an MLM style referral program built into their blockchain to earn affiliate commissions when more people join the DasCoin network through your referrals. Bitcoin utilizes a purely decentralized network of nodes that sustain it. That means there is no direct oversight entity, government or banking institution in charge of the network. A sophisticated algorithm built into the Bitcoin blockchain “sets the rules”, and no one can change that. That presents a good deal of democracy to the Bitcoin community. There is no central body that owns the system or one to change the terms and conditions of how Bitcoin works. However, corrupt and crime syndicates have exploited Bitcoin’s decentralized and anonymity factor to abuse the system and run crime circles by peddling fraud and trafficking money through the network. This is possiblebecause there’s practically no one to make sure no one abuses the system that way. DasCoinuses a hybrid system. It is part centralized with a board to oversee operations and DasCoin minting, and part decentralized in its distribution of DasCoins. We’ve covered the decentralization goodies and risks, here’s the lowdown on cryptocurrency centralization. DasCoin has a management team or board that runs the DasCoin network. That means DasCoin is a private blockchain, unlike Bitcoin. DasCoin, the company, can dictate how everyone should use the system, which is both good and not so good. Also, and this is where it can beat Bitcoin, the central authority in charge of DasCoin can ensure the system is not abused by criminal circles like in Bitcoin’s case. On the other hand, being a privately run entity means it’s like any company out there to make money. You lose the democracy exuded by Bitcoin once you sign up to DasCoin. You play according to their rules. These are just some of the quick differences between Bitcoin and DasCoin meant to jerk your crypto comparison curiosity before investing in any one of them.